There were times last weekend when people the whole world over were looking through their TV screens at our little patch of LS11. If you watched closely you could see the staff at the Old Peacock waving gleefully in the background, or more likely sweeping up the debris from the rugby hordes who invaded the pub prior to their respective World Cup games, and did so again after the final whistle on both Saturday and Sunday. Of course the staff are used to Leeds United match days, safe in the knowledge that every Leeds fan knows the pub is there and that it has been in the fabric of the match day experience for many decades and for many generations of fans. We weren’t sure whether the visiting rugby fans from Scotland, USA, Italy and Canada would be quite so wise to the hospitable surroundings of Elland Road, and whether the natural magnetism of the Old Peacock would draw as many fans in as for a Leeds United game. 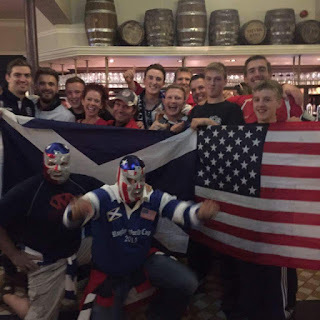 But it quickly became apparent that rugby fans suffer from the same hollow leg syndrome as our Leeds United friends, and they swarmed all over the pub on both days to create a vibrant and friendly atmosphere. Sunday for the Scotland game was particularly lively, but on both days it was strange to see so much colour – particularly the Canadian Red! – and also to see rival fans happily chatting, drinking and, yes, dancing together. All in all it was a great weekend and a big success for the city of Leeds, and we were as Proud as a Peacock to play a part in it. We receive a lot of comments about the refurbishment that took place in 2013 when Ossett Brewery took over the pub and changed the style, outlook and ambience, we think, for the better. People love the ‘Leeds United’ styling with the white and yellow floor tiles, the Peacock floor mosaic and the black and white framed photos on the wall. 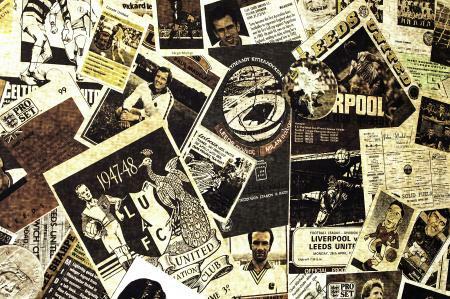 What people seem to comment on most, however, is the Leeds United memorabilia wallpaper that adorns the main room and the toilets. First things first, it cost £400 a roll to produce and no, it can’t be bought commercially. The idea for the wallpaper was the brainchild of Ossett Brewery’s joint managing director Jamie Lawson who worked with a designer to create the sepia-tinted montage of Leeds United history. Of course this required obtaining hundreds of different artefacts to display on the paper and the main supplier of those was Dave Gaertner, who at the time was Publicity and Media Officer for the Leeds United Supporters' Club. What also strikes you about the wallpaper is that it is subtle, understated and refined, with a style that doesn’t pummel you square between the eyes like the garish, uncultivated décor you find in some football pubs. The Peacock is a football pub with a difference, and that is how we like it. Who knew that the production of a few rolls of wallpaper would create such a talking point, and certainly it is to be hoped that there are some spare rolls knocking about somewhere, just in case of mishaps. Although if there’s one way to ensure drinkers don’t knock chunks out of the walls and throw beer about, this is undoubtedly it. After the Rugby World Cup bandwagon rolled out of town, the ever-ready Old Peacock staff soon turned their attentions to the welcome return of Leeds United home games, and a couple of 3pm Kick-Offs in October. It would have been three of course, but Sky Sports in their wisdom have turned a traditional Saturday afternoon occasion versus Blackburn Rovers at the end of the month, into an awkward Thursday night rush; thus probably shaving about 5,000 off the Elland Road attendance. Evening Kick-Offs are a necessary evil and a bit of a pain for everyone, but you accept them as part of the furniture. To be presented with another one purely to satisfy Sky Sports leaves a bitter taste, but as football fans we will take it on the chin as always. September was a sticky month for Leeds United; with one win, one draw and two defeats. Home form is the real issue now with no win at Elland Road since last March, but alas after losing 3-0 at high-flying Middlesbrough last weekend the games don’t get any easier; with in-form Birmingham City and top-of-the-table Brighton visiting Elland Road in the next two games this month. Still, we will be opening our doors as normal, and of course the traditional Old Peacock pre-match build-up involves all of us drinking a couple of pints and swiftly believing Leeds can pretty much beat anyone. It’s all part of the service. So until next time, enjoy the home games, visit us during the week to sample our fantastic menus and stay informed via our social media channels on Twitter and Facebook.